Trend Micro Presents Two Major Awards to CT Link Systems for FY15 Champion Performance – CT Link Systems, Inc.
September 27, 2016 — Trend Micro, on its Partner Day celebration held at 12 Monkeys Music Hall & Pub in Century City Mall, presented CT Link Systems, Inc. with two major awards: FY15 User Protection Champion and FY15 Network Defense Champion. 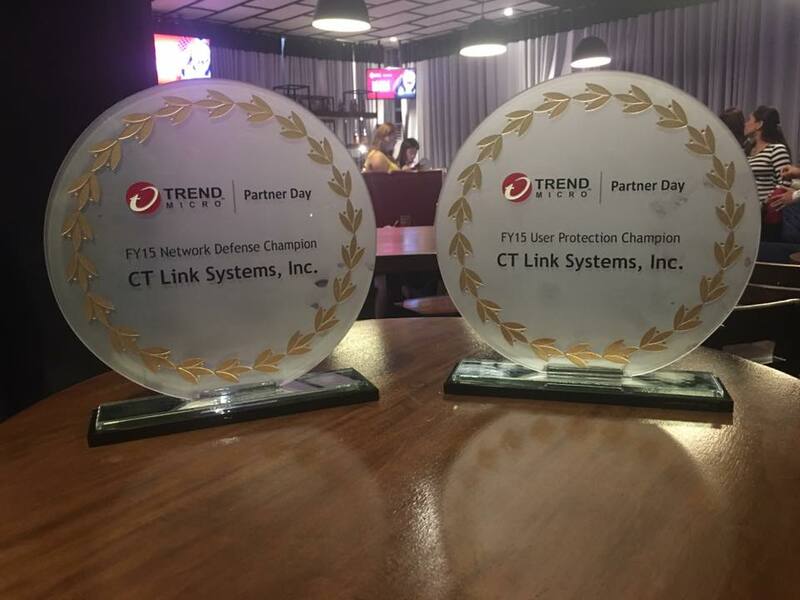 Trend Micro also awarded CT Link Systems as FY15 Network Defense Champion and acknowledged the major contributions of CT Link Systems in providing Trend Micro Deep Discovery solutions to customers. Trend Micro Deep Discovery enables users to detect, analyze and respond to today’s stealthy ransomware and targeted attacks in real time. Deep Discovery provides protection against proven ransomware and advanced threat. It interoperates and integrates with user’s security infrastructure. With Deep Discovery, users will have a comprehensive defense tailored to protect their organization against targeted attacks, advanced threats and ransomware. For more information on Trend Micro solutions and products, please contact CT Link Systems at 893-9515. ← Is Your Business Automatically Backing Up the Data in Your PCs and Laptops?